Up until I got involved in the world of beauty, the contents of my handbag included everything but the kitchen sink, but at the same time I was never organised and never actually had anything when I needed it. Instead I'd end up lugging a load of junk around with me, doing my back in for precisely no reason at all. I was on my way into Crown Court for a university project once, and the metal detectors picked up a giant pair of scissors in my handbag. True story-I must have looked like some kind of psycho killer; how they got in there or how long they'd been in there I really don't know! I never really became an organised person until I moved into my own flat, and that's when I became organised with a vengence. I know at least a few of you out there are going to be organisation crazy like me, and so if you're looking to put together a perfectly equipped handbag here are ten of the things that will make your day run a bit more smoothly. So many bad hair days could have been saved if I would have just carried an umbrella. Can you honestly think of a worse start to your day than spending an hour styling your hair just to get soaked at the bus stop, and turn up to wherever you're going looking like a drowned rat? The thought fills me with anger and dread. How dare you, weather! Travel size or compact umbrellas can be kept in your bag without contributing much weight, and can save you from situations like this. I don't know whether public toilets hate me or if I'm just unlucky, but it seems like every one I end up in is always out of tissue. I got in the habit of carrying tissues with me way back when I was at school; my advice is always have your own supply, they come in really handy. Whether you want to quickly eat something on the go or just top up your makeup, using antibacterial hand lotion first will stop you from spreading germs everywhere if you can't get to a sink. You can get little travel sized bottles by the tills in Primark for about 50p which I have quite an obsession with. Lets face it, pocket sized products are always fun. It's definitely best to keep this to just the essentials, because in my experience piling a load of makeup into your bag can cause it to get very heavy very quickly. As a beauty addict I understand that keeping the makeup you bring with you to a minimum is difficult, but just focus on things you're actually likely to use. Concealer, powder and a daytime lipstick for topups should do just fine- leave the ten different lip colours and your best smokey eyeshadow at home because you're probably not going to need them if you're just popping out to the shop. As great as makeup is, its definitely high maintenance and something you should be checking on if you're going to be out all day. Don't get home at the end of a long day to realise your immaculate bold lipstick from this morning is now all over your cheek and your mascara is all over your face. People might not be kind enough to point it out! Don't ever find yourself in an awkward situation where someone is speaking face to face with you, and you've just eaten a cheese and onion sandwich or something equally as offensive for lunch. Cringeee. Of course you could avoid certain foods, but even things like coffee can smell disgusting on a persons breath. Having mints, chewing gum or some kind of minty spray close by will rescue you every time. Never be caught short in those 'does anyone have a pen' moments. This could be anything from scribbling a message to someone on a post it note, or writing a birthday card at the last minute. I just love being organised, and not have to scrabble around asking to borrow things like a pen when it's so easy to throw one in your bag. Carrying enough money for at least a phone call from a pay phone, or enough for a bus if you were ever stranded or lost is a good idea. It might not seem all that likely, but if it were ever to happen you will be glad you came prepared. What if your car broke down and your phone was out of battery? Or you took a wrong turn in an unfamiliar place? A credit card wrapped in duct tape is an idea I read recently which I thought was great. Too much effort to remove for impulse purchases, but could still be removed if you were stuck and really needed it. If you're ever locked out of your house or car, the chances are you'll still be carrying your bag. I was constantly getting locked out when I was younger and spent many a reflective (and utterly boring) hour waiting for someone to come home to let me in. Get an extra key cut and put it in a safe pocket in your bag or purse. If your regular set ever wonders off or you forget to put them in your bag, it's spare key to the rescue. If you have a condition that means you rely on regular medication, or know that you can't see without your contact lenses or glasses it's always going to be handy to keep some spares in your bag. I have a friend who would forget her contact lens case and solution every single time she'd come to stay over at mine (it would be the same palaver every week). Some simple organisation can save you so much trouble. Even if you have a condition that's not particularly serious such as hayfever or indigestion, having the right tablets with you will mean you're a lot more comfortable throughout the day. Of course this list isn't comprehensive, depending on what you do throughout the day there are probably a load more things that you just can't leave the house without. But armed with these staples you should at least be able to get yourself out of the day-to-day mishaps that can sometimes occur, and stay looking fab in the process. 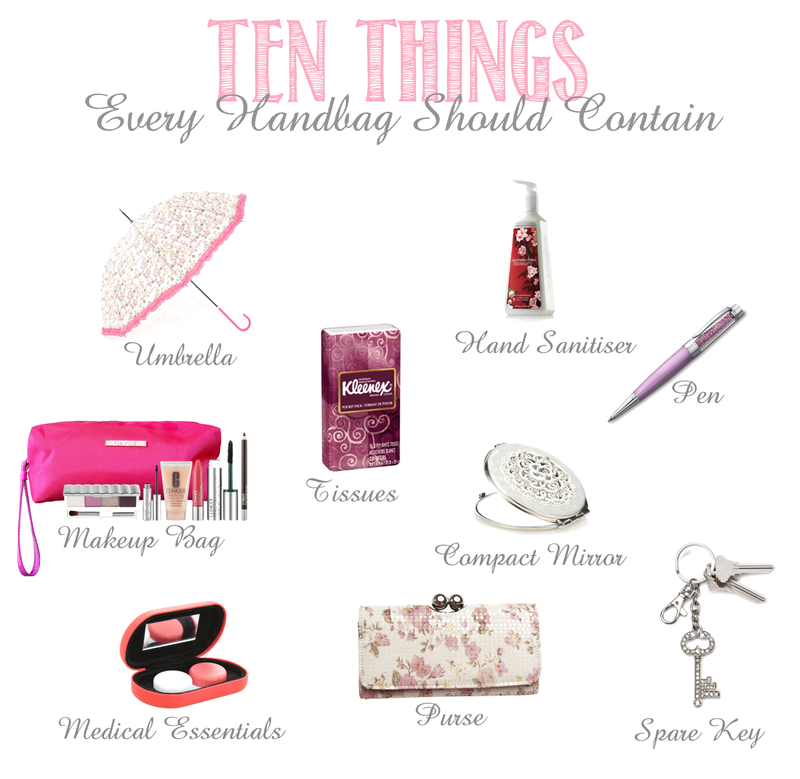 What are your handbag essentials? Is there anything you never leave the house without? Thank you for your lovely comment on my blog :) and thank you for following, i'd love to follow back! This was a good blog! Loved this! The umbrella is a must, because oh boy have I had some bad hair days due to rainy weather. The pills too is a great tip! Great post! I never carry an umbrella...I might just have to throw one in my car from now on.